Wynright's AS/RS Robotic Buffer is an ideal solution for applications where an intermediate buffer is required. Volume imbalance between processes create additional labor costs, and floor space for staging product comes at a premium. 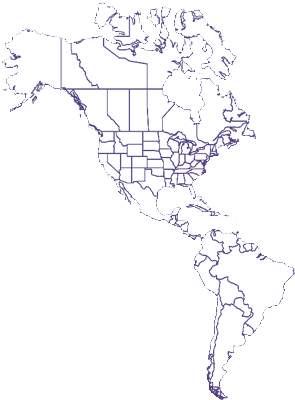 Where other conventional approaches to product buffering are cost or space prohibitive, this offers proven technology in an innovative arrangement. 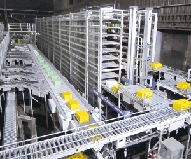 Daifuku's automated rail-guided vehicle system SORTING TRANSFER VEHICLE is a pallet sorting system designed to provide high-throughput material handling in conjunction with Automated Storage and Retrieval System (AS/RS). 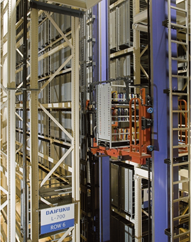 A single or multiple STVs connect stacker crane aisles and in/out stations to efficiently store and deliver pallets. 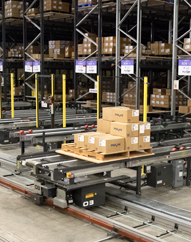 STV systems can work with AS/RS as pallet sorters and sequencers in shipping preparation areas, or as a standalone system. 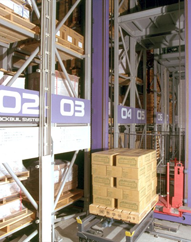 The Shuttle Rack is a superfast mini-load AS/RS used for picking and shipment sorting. The system has a cart positioned on each rack level. The mini load is a high-speed, high-density buffer that can replace conventional static rack to maximize vertical storage space within a compact footprint. The mini load moves and stores irregularly shaped goods or parts placed in: stacking totes, collapsible totes, nesting containers, case/cardboard boxes and bins. The system handles containers that weight up to 662 lbs. Rack height ranges from 10-66 ft.
Wynright's unit load is a high-density pallet buffer designed to maximize vertical storage space while maintaining a compact footprint. Several models are available to handle pallet loads from 1,100 to 6,600 lbs. and rack heights up to131 ft. The unit load can also be used to store long or bulky items, hazardous materials and it is also ideal for freezer and low-noise applications. 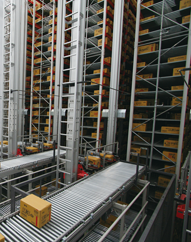 In addition to a standard unit load, a double deep rack configuration is also available.